How did we survive the Olympics without phone apps? Depending on where you're geographically located, you may be privy to several phone apps for the Winter Olympics. 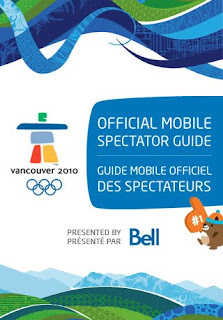 In Canada, there are at least three: CTV's official broadcast app, NBC's official broadcast app, and the 2010 Guide: the Official Mobile Spectator Guide. Hands down, the 2010 Guide is THE app to have. Where the CTV and NBC apps end, the Official app -- brought to us by Bell -- goes above and beyond. All sports are represented with thorough descriptions of each event, plus venue details, maps and medal standings. Best of all, the information is continually updated. Say for example you're watching women's figure skating live on TV...open the 2010 Guide app and select women's figure skating. The app will automatically update the standings, skater info (including what music they're performing to) and more! While the app won't completely eliminate the need to watch the Games on television, it will enrich the viewing experience. On the go? This app will keep you completely on course & in the know. Scroll through the latest Games' news, keep track of your favourite events and check out what non-sport activities (concerts! performances!) are happening in Vancouver & Whistler - you can even follow Twitter feeds! It's all here, and it's wrapped up in a cool, easy to navigate style. Best Olympic app by far -- and it's FREE! No wonder it's the #1 free app on iTunes at the moment! With a week of the Games still left to go, there's still plenty of time to enjoy this useful & fun app.